Hey all. Today I’m stepping outside the box to cover a review in honor of a friend of mine. Master Seaman Chris Jenkins, who recently moved across the country and won’t be in our neck of the woods for the next three years. Ah, that’s going to be rough. Luckily, there’s still this thing known as the internet and the communications it allows for. 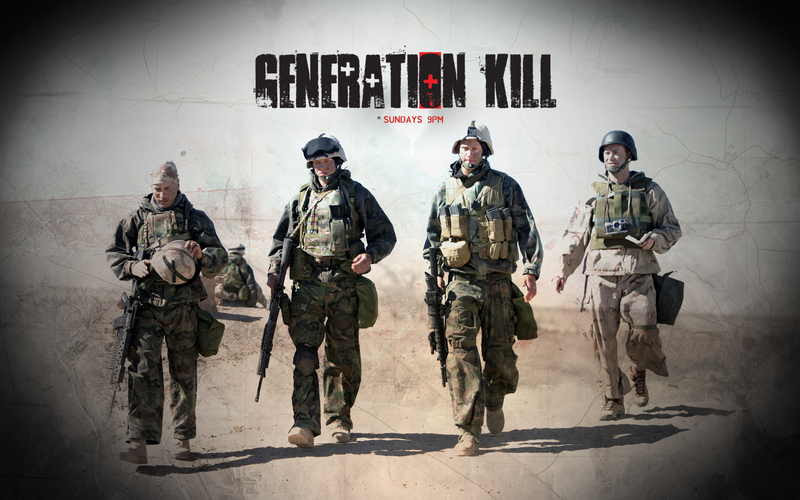 For those who don’t know, Generation Kill was an HBO miniseries adapted from the book of the same name. Said book was the result of reporter Evan Wright’s own experiences as an embedded reporter with the 1st Marine Reconnaissance Battalion during the 2003 Invasion of Iraq. In the course of his time with them, he had a first hand view of the invasion and all the problems that resulted. And therein lies the real value of this miniseries. Whereas many people who witnessed the invasion, particularly in the US, seemed to think that the initial phase of the war was a success, that problems didn’t arise until after the occupation began, this series and the book that inspired it shows that the problems that would come to consume Iraq were there from day one. These included lawlessness, incompetence on behalf of the civilian planners, civilian deaths, insurgency, and the glaring gap between the reality of the situation on the ground and how it was being portrayed by politicians and media. 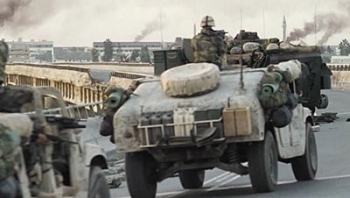 The story, which begins with the invasion and culminates in the arrival and settlement of 1st Recon around Baghdad, is told through seven episodes. Each one catalogs a different phase in the war effort, showing events from multiple points of view of those who fought with Bravo Company, the Company which led the way during the invasion. The episode opens with the 1st Recon Battalion, Bravo Company, conducting training drills inside Kuwait outside of Camp Mathilda. The embedded reporter from Rolling Stone magazine, Evan Wright (Lee Tergesen), arrives at camp and is given to 2nd Platoon where he receives a frosty welcome. Considering him a member of the “left-wing liberal media” they don’t have much love for him, until they learn he used to write for Hustler magazine! He quickly makes the acquaintance of the men of Bravo company whom he will be riding with in the lead Humvee. This includes Sgt. Brad “Iceman” Colbert (Alexander Skarsgard, Erik on True Blood), Cpl. Josh Ray Person (James Ransone), and relative FNG Lance Cpl. Harold James Trombley (Billy Lush). Throughout the first episode, we also get to meet many other “characters” of interest. These includes Lt. Col. Stephen Ferrando (Chance Kelly), who was given the nickname ‘Godfather’ because throat surgery has left him with a harsh, whispery voice. Then there’s Lt. Nathaniel Fick (Stark Sands), the levelheaded commander of 2nd Platoon; Cpt. Craig ‘Encino Man’ Schwetje (Brian Patrick Wade), the well-meaning but incompetent commander of Bravo Company; Dave ‘Captain America’ McGraw (Eric Nenninger), the edgy and unstable commander of 3rd platoon; and Sgt. Rodolfo ‘Rudy’ Reyes, aka. “Fruity-Rudy” (played by himself), the metrosexual Marine who acts as the glue of Bravo Company. 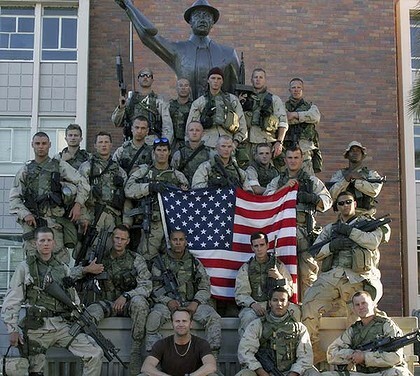 Significance: This episode familiarizes the viewer with several realities that Marines in the 1st Recon had to deal with. The first and most obvious is shortages, which the Marines are constantly told to make do with. The second is the fact that much of Bravo Company’s own officers are inept, enforcing pointless rules instead of focusing on troop morale or making sure they have the right kinds of equipment. 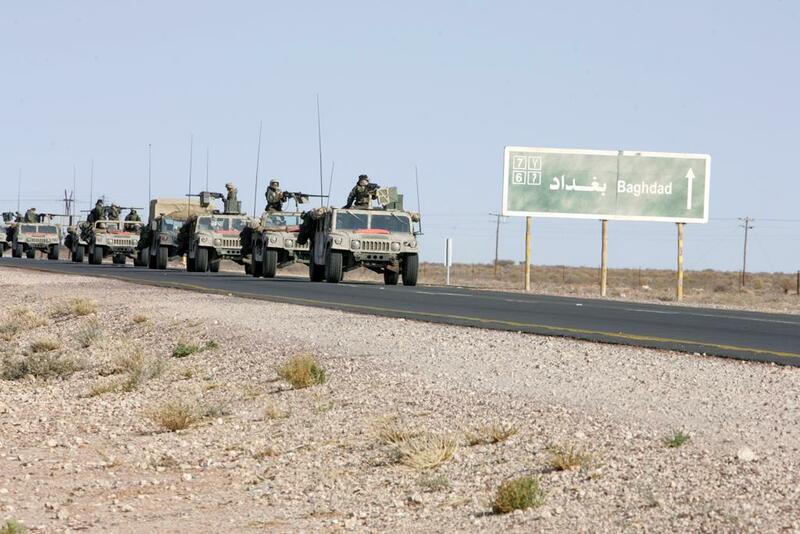 The invasion is now underway and 1st Recon is sent to An Nasiriyah where the invasion has stalled. 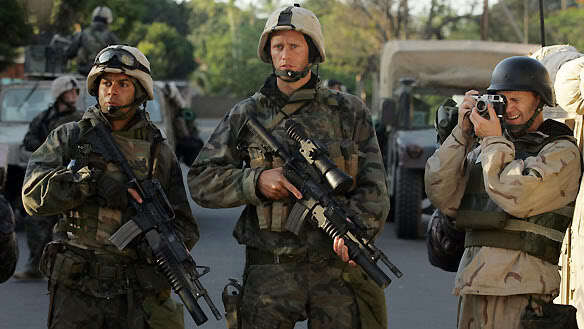 Bravo Company begins to lead the way through the town and is given orders to fire on anyone they deem a threat. They encounter minimal gunfire until Cpt. McGraw, using a captured AK, opens fire on civilian cars for no apparent reason. They continue to press forward north into Mesopotamia, “The Cradle of Civilization”. After taking a wrong turn, Bravo company rushes onward to reach to its next objective outside the town of Al Gharraf by nightfall. 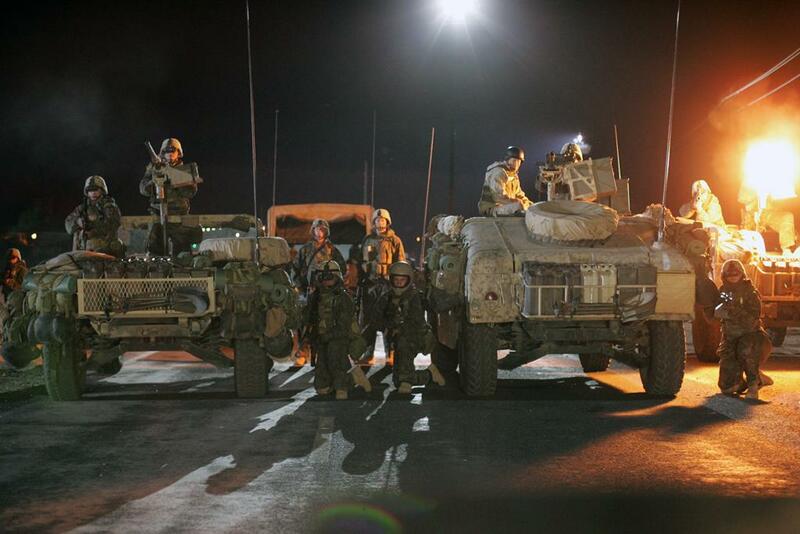 In the dark, Bravo company comes under fire by a group of armed Iraqis and takes them down without difficulty. They score their first kills and survive their baptism by fire, and Bravo company celebrates before moving on. Significance: This episode is the first time that 1st Recon experiences combat and the first time that Cpt. McGraw commits a stupid act in the line of duty. His confiscating of an AK and firing randomly is a constant source of irritation as time goes on, but nothing is ever done about it. In addition, this episode, specifically the layout of the town, the bridge and the operation into the town, was the inspiration for COD: Modern Warfare 2, much like how scenes from Enemy at the Gates inspired Call of Duty 1 and 2 and COD: World at War. After surviving their first engagement, Bravo presses forward. When they reach a roadside hamlet, the company look on in disbelief as a regimental combat team arrives and obliterates the hamlet and its inhabitants, none of whom appeared to be armed. Shortly thereafter, Bravo heads north to the town of Ar Rifa, where Captain Schwetje orders a “danger close” artillery barrage on the settlement. Lt. Fick intervenes to try to prevent the unwarranted barrage, but to no avail. Once again, civilians are killed due to incompetence of senior officers. Eager once more to press ahead, “Godfather” orders 1st Recon to push ahead another 40 km and capture an airstrip being controlled by Iraqi Republican Guard unit that is apparently equipped with tanks. Once again, Cpt. MgCraw begins to undermine morale by making all kinds of panicky statements, namely that they are going to die if they go up against the tanks. Also, in order to reach the airfield, they are forced to leave behind their supply trucks behind. Once again, Bravo Company is given permission to open fire on anything that moves. 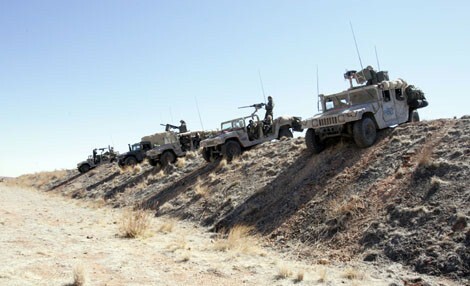 In the lead Humvee, Cpl. Tromblay opens fire on people running along the roadside and severely injures a small boy. The Company secures the airfield, which appears to be abandoned, and then insists that command medevac the boy to a nearby base. Command is hesitant, but eventually agrees, and both Sgt. Colbert and Cpl. Tromblay are to told to expect consequences for the incident. Significance: In this episode, we get a solid glimpse of how civilian deaths in Iraq are being swept under the rug and written off as justifiable. The soldiers are beginning to feel the weight of this and cracks begin to show in their morale and resolve. After both engagements, in the hamlet and Ar Rifa, they tell each other to put it out of their minds and move on, knowing that there isn’t much they can do about it. 1st Recon reaches the airfield and encounters minimal resistance, the Republican Guard unit having already evacuated and left their tanks behind. This puts 1st Recon ahead of the rest of the American invasion, which is seen as something favorable to command. However, they soon learn that by leaving their supply trucks behind, that Iraqis have captured and looted them. Amongst the supplies was most of Bravo Company’s rations and an American flag, which means they are now down to one meal a day. Alpha Company is then tasked with a different mission: to recover the body of a captured Marine who was murdered in Ah Shatra. The mission takes a turn when when CIA agents show up and declare that a special army of Iraqi Freedom Fighters will take the town for the sake of their propaganda campaign. However, the army deserts the next day after an artillery barrage fails to clear the town of the enemy. Meanwhile, Bravo company continues clearing hamlets along the northern route and sets up a roadblock outside of Al Hayy. The rules of engagement here are unclear, and Bravo ends up destroying a large truck and killing all passengers, uncertain if it even posed a threat. Significance: Three major developments happen in this episode, all of which demonstrate a considerable amount about the unfolding war. First, it becomes clear to the Marines that their officers are making all the wrong calls, but as long as they continue to be successful, command will keep making them. The operation outside of Al Hayy shows just how important propaganda efforts are to the war effort, namely maintaining the illusion that the Iraqis welcome the invasion as liberation. And last, we get a first glimpse of how the Marines will have problems acting as police in the streets, mainly because they are not trained for the role. 1st Recon finally gets some solid intel from the locals, which says that there is an ambush waiting for them up ahead. The ambush is attacked by some LAV’s, and Bravo is ordered to cross the bridge at night. However, they hit a snag along the way and the convoy gets stuck, just as a group of fresh ambushees show up to attack them. Schwetje once again shows his incompetence by being unable to resolve the situation, and Cpt. McGraw once again panics and begins screaming over the open radio. Things are only resolved when Rudy intervenes and inspires Cpt Schwetje to think outside the box. By morning, Bravo company learns that they are not soldiers, but militiamen, many of whom came from Syria and farther abroad. On passports recovered from the bodies, it says that their reason for coming to Iraq was “Jihad”. Bravo continues north to Al Muwafaqiyah, where they are tasked with setting up another roadblock and with destroying the Republican Guard outpost, which, unfortunately, is in the town’s only school. Despite Colbert’s orders to hold their fire unless its absolutely necessary, Bravo has another incident at the road block and a small child is killed. Significance: This episode is especially significant because it shows how the roots of the insurgency began long before the war ended. Whereas Captain Schwetje thinks this is proof of what Bush said about their being terrorists in Iraq, the others see from their passports that the “Jihadis” didn’t enter Iraq until the day after the US declared war. Already, the invasion is beginning to have consequences that no one seemed to plan for, particularly in how it is involving people from outside Iraq. What’s more, the mounting civilian deaths is forcing the Marines to question the war and what their role in it really is. Outside of Al Kut, Cpt. McGraw nearly kills a prisoner with his bayonet after his Company defeats a small group of armed Iraqis. His men are becoming more disillusioned in his command, and Sgt. Eric Kocher (Owain Yeoman) of 3rd platoon learns that he is being held accountable for the incident. Afterward, McGraw’s men refuse to allow him to anywhere near prisoners, for fear that he will attempt to stab them again. In addition, 1st Recon learns that Godfather’s counterpart in the Regimental Combat Team is being relieved of command despite his success. Apparently, command is reigning people in due to problems with deaths and insubordination. Problems also begin to arise between Captain Schwetje and Lt. Fick because of their earlier disagreements after he hearsof this. Schwetje’s NCO, Gunnery Sgt. Ray Griego (David Barrera), suggest to him that command is alluding to Fick’s own insubordination when they spoke of insubordination, and begins spreading rumors about Fick behind his back. While Fick is told not to question Schwetje orders again, Fick demands that Schwetje also reign in Greigo for his unprofessional and insubordinate behavior towards himself. Shortly thereafter, 1st Recon is tasked with escorting Iraqi civilians fleeing from Baghdad down the highway, a mission which makes them feel humane amidst all the slaughter. Colbert is confronted by an Iraqi woman who speaks perfect English and challenges him on the nature of the war, which he appears to take to heart. Unfortunately, while attempting to peacefully force cars coming the opposite direction turn back, another Iraqi is killed, this time an old man. Significance: The immediate value in this episode is in how it shows how the wrong people are being blamed for failures while those who continue to screw up remain in positions of authority. We also get to see how the war is being perceived by the Iraqis, which is put into words by the female student who challenges Colbert on the road from Baghdad. And last, the incident involving the old man shows once again how civilians are being killed because combat soldiers are being assigned police duties, again as the result of bad planning. And last, but not least, it is indicated that the troops are now within reach of Baghdad, which they hope will end the war and all the stupidity and craziness they have been forced to endure. 1st Recon finally reaches Baghdad and is treated to some rest and reprieve in an abandoned cigarette factory. However, the rest doesn’t last long as they are called upon to mount patrols into the city and deal with shortages, looting and sporadic sniper fire. Having only one translator, they are limited in what they can do and realize the problems the residents are face are entirely beyond their abilities. This is complicated further by constantly changing orders, a lack of necessary supplies, unruly locals and cultural misunderstandings. The situation only gets worse and the city continues to descend into anarchy. 1st Recon is soon relocated to a soccer stadium away from the action. At their new digs, the tensions that have been simmering for weeks finally boil over during a friendly football game. Wright conducts his last interview with Godfather where he learns that McGraw is not going to be punished for two near-stabbings. He then says goodbye to the men of 2nd Platoon being carried off by helicopter, an event which seems tearful after all they’ve seen together. One of the Marines begins to show the movie he’s put together from the footage he’s shot over the course of the war. While the men initially enjoy watching it, they slowly begin to lose interest and drift away, thanks to all the bad memories it evokes. Significance: This episode is the most significant of all because of how it showcases the reality of life in Baghdad during and immediately after the war. Contrary to public perceptions, the chaos and violence were almost immediate, and it was abundantly clear that the military hierarchy had no idea what to do about it. this, above all else in the show, highlights the lack of planning on behalf of the Bush administration and the Pentagon before the war began. Faced with victory, the soldiers were completely unprepared for the situation they faced as soon as the shooting was over. Of equal significance are the scenes at the soccer stadium, where everyone seems burnt out and angry despite the fact that the war is now over. No one is in the mood to celebrate; in fact, everyone seems itching for a fight for someone specific. During the pick-up game, Schwetje is punched in the face by one of his men, and Cpl. Person attacks Rudy for no apparent reason. During his final interview with Lt. Col. “Godfather” Ferrando, Wright learns that there will be no consequences for any of the officers who screwed up along the way, highlighting the lack of accountability that runs like a vein through the show. 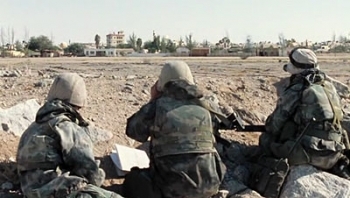 And finally, the scene where the Marines watch the video – this is the only scene in the miniseries that is accompanied by background music. Not a word is said, and yet the mood and the point are conveyed so clearly. The war is done, they have won, and yet everyone feels terribly bitter and angry. All that we need to know about the Iraq War is said in this one scene, with the men who fought in it preferring not to see the replay because it reminds them of everything they want to forget. As if it wasn’t clear already, I LOVED THIS MINISERIES! The tone, the pacing, the subtle way things are conveyed, the gritty and realistic nature of it all. It captured the essence of war, and was so much better because you watch it knowing that it all happened. Some might say that since it is being told from one man’s point of view, it would reflect his own particular biases and perspective. However, the series is shot from multiple points of view and reflects the very in-depth interview process which Wright conducted before releasing the book. This comes through immediately in the show, where Wright appears to be little more than a background figure until the very last few minutes of the last episodes. And even then, the focus shifts back to the troops, where it always was during the course of the series. This diversity of perspectives gives the show a very broad and varied feel and let’s the viewer become acquainted with all that is going on, which is essential given the nature of the show. Above all, what makes this story so effective is that it is a first-hand account of the events that took place in 2003, told by a member of the same media that helped to sell the war to the American public. Defying the conventional view that the war was an act of liberation that was embraced by the Iraqis, and only went bad long after major combat operations ended, the series shows that this was an operation doomed from the get-go. All the problems that would later come to haunt the “rebuilding phase” – basic shortages, cultural misunderstandings, insurgents, civilian deaths, failure to plan, shifting orders, and negligence in dealing with rioters and insurgents – were all there from day one. For many years after the invasion, the American people were left in constant state of confusion and controversy as an intransigent administration and hand-picked military spokespeople tried to spin the situation, refused to accept responsibility for the failures, and insisted the situation was salvageable. It was only with time that they came to realize that the truth was always there, happening on the front lines, and that it was kept from them for political reasons. The situation had not changed, only their perception of it.